Pal Pal and Discover announced this week that they’re teaming up to bring Pay Pal to store locations – millions of them – in 2013. For the 50 million Pay Pal customers in the U.S., it opens up new payment options. While small business owners have traditionally relied on the PayPal debit card, this might not seem such a big change, but for the average consumer, they now can choose to make purchases using their PayPal balances. If a store accepts Discover, it accepts PayPal. Already this year, PayPal has found its way to more than 3,000 retailers and also launched PayPal here. Remember, PayPal is EBay’s payments unit. This move promises to put PayPal in the lead as the digital wallet movement pushes forward. The ‘milestone moment’ allows Discover customers to bask in new benefits, without the bulk of new hardware or software. This relationship will deliver a truly seamless digital wallet, available most places consumers shop offline. 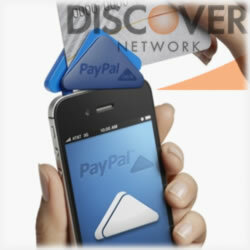 Retailers that already accept Discover card payments will not have to install or upgrade anything, PayPal promised. While the announcement didn’t include specific details for business owners wishing to offer this to their customers, it did say it expects the program to bring back the more traditional shopping methods with the convenience of an online payment experience. result in real change and innovation for the industry by bringing new technologies to the point of sale that benefit merchants and PayPal customers. The market has been looking for leadership as the payments space evolves and we think this relationship starts to deliver it. It is a milestone for PayPal as it enables us to innovate at scale. One of the great things about this relationship with Discover is that merchants won’t have to install or upgrade existing point-of-sale hardware or software to offer PayPal. Through our deep relationships with retailers all over the world, we know they’re always looking for ways to innovate and compete in this rapidly-changing commerce landscape. And speaking of its digital wallets, PayPal Here was unveiled earlier this year. It allows companies to process credit card payments with the consumer’s smartphone. It’s already giving its biggest rival, Square, a run for its money. PayPal missed out on the coveted Starbucks contract, however. Square was already in talks with the coffee giant as PayPal was wrapping up its own offering. These gadgets are becoming very popular with those who have kiosks or who offer services at arts and crafts fairs or have sales off site. Already it’s gaining rave reviews. It’s designed to help merchants – both big and small – make more sales and grow their business with confidence. And by “confidence”, we mean hassle free and frustration free. We recently test drove it and out of the twelve transactions we made, we had absolutely no problems. The fair-goers credit and debit cards all swiped properly the first time and because our tester’s sales were small (it was at an arts & crafts fair), there wasn’t any need for delays in approvals, etc. It truly opens up choices for these small business owners. They can accept payments by swiping cards with a fully encrypted thumb-sized card reader, or use a phone camera to scan and process cards and checks. It also allows them to invoice directly from the mobile app and, of course, accept PayPal in a brand new way. In all fairness, we haven’t had a chance to test Square, but if this is Pay Pal’s version, we can say this is the new way of paying and accepting credit cards. Both PayPal Here and its latest teaming with the Discover network are just two of the latest additions to the payment giant. With its many solutions for consumers and small businesses, it continues forward with its goal of becoming the financial sector’s solution. We’re happy to be helping small businesses around the globe take the pain out of payments and let them focus on what they do best – running their business and growing their customer base. If you’ve ever used PayPal during the holidays, odds are, you know full well the security of the PCI-compliant checkout options and invoicing choices. The company says it’s the trust Pay Pal name that’s the “key differentiator” and it’s true that branding means everything. When Pay Pal blew onto the scene more than a decade ago, it changed everything. Two decades ago, people couldn’t have earned their living online selling their goods without a lot of worries about payments. eBay and Pay Pal changed that in one fell swoop. Now, there’s very little that can’t be done online. Pay Pal touts more than 100 million customers around the globe and years of proven payment innovation. It’s also important to keep in mind its leading world-class fraud management capabilities. Call anytime day or night and you can easily access live customer support. In addition to accepting more payment methods, PayPal Here offers a simple flat rate of 2.7% for card swipes and PayPal payments. If you’re already using a Pay Pal debit card, you know how great the cash back is and this essentially knocks your rate down to just 1.7%. Currently, PayPal Here is available only to merchants in the United States, Canada, Australia and Hong Kong. In another press release, it announced it would be opening it up to all other merchants in other countries next month with announcements each time a new country has been added. Finally, there’s a nifty video on the Pay Pal site that demonstrates the PayPal Here.